Still no second sock, still looking, still keeping a stiff upper lip about it. Finish the storage room. I started that on Saturday which makes it a five day job so far and though I've lost count of how many bags and boxes I've kicked out the door there seems to be a long way to go. I gotta do it though. That particular clutter is like weeds - if you don't get all the roots and the clean up the flowerbed, just staying vigilant isn't ever going to be enough. Not today as it happens, but yesterday, when it was unbeLIEVably cold out. Like whOA, what am I doing outside with a camera cold. Or perhaps, What price blog beauty cold. 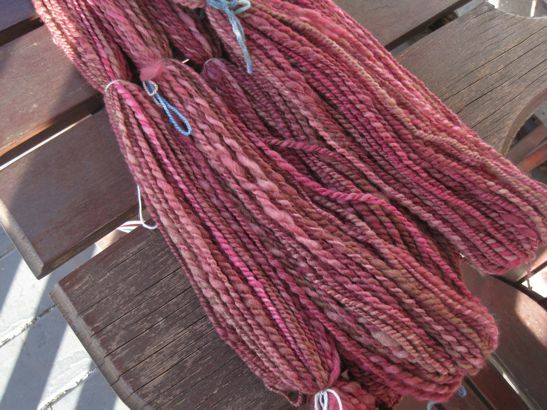 You saw this yarn before, when I first spun it and it was still in tightly wound balls waiting to be skeined and Soaked and dried. This is it after all that part, waiting for me to wind it back into a ball, or into a cake if I can clear enough Stuff off the only counter my ball winder will clip onto. Spinning is the only creative pursuit I've had since New Year's Eve, unless you count tossing out stuff as creative (and after a few hours when the crazy sets in, I do.) Truly, I have not knit one stitch in 2012 so far. On the upside, in addition to a much more organized house, I do have a whole little row of freshly-spun balls of yarn positioned across the top of a cupboard near the TV, out of reach of the Tidying Frenzy, just waiting to go through the whole skein-Soak-dry process. If the weather is a little warmer tomorrow and the storage room work goes well, maybe I will take a picture of them.